Hello everyone and thanks for stopping by Reader Girls. We are today's stop on the Moonset Blog Tour hosted by Rockstar Book Tours. We have a guest post written by author Scott Tracey, our review, and there's a tour wide giveaway to enter. You can find the tour listing here. Why do you write paranormal YA? One of the best parts about writing something with a paranormal element is that you can deal with things in a different way than normal, but still deal with the core element of the issue. One of my all time favorite examples of this is from Buffy, way back in the second season where after a moment of happiness between the characters, Angel loses his soul. The real life story element was "the guy who sleeps with the girl and changes once he's gotten what he wanted." The show took that, and twisted it and made it something unique and different, but it was still the same issue. A paranormal element allows you to deal with things in a safer way - if your ex is a vampire, then killing him suddenly becomes an alternative. Also, paranormal stories also have a greater chance for a happy ending (which isn't always an option in real life). Instead, you get to throw this whole other element into the mix, which can take some of the pressure off. Like with MOONSET - strip away the magical elements, and it's a novel about kids in the foster system who are raised in an environment where they're told, repeatedly, that they'll turn out just as horribly as their parents did. Paranormal novels have benefits in that the villains can be more obvious, and easier to defeat. Sometimes it's hard to make a situation out to be entirely black or white, or to separate the heroes from the villains. In a novel, there's more freedom to resolve a difficult solution, to beat the villain and have the happily ever after you're after. I like to write about magic and witchcraft, and it's mostly a power issue. High school can be one of those times in life when you have the least amount of control over your life possible. Magic is attractive. You can make things happen just by wanting them. I love the idea of what people would do if they only had the power to enact the change they wanted to see. Of course, most of my books also involve horrible evil, so most of the time they're only using magic to try to fight off the bad guys so...it's a toss up. I jumped at the chance to read Moonset simply by reading its summary, plus I'm a paranormal freak and witches are cool. Scott Tracey's witches are even cooler. In the witch community, Moonset is a dirty word. It carries the weight of the worst curse word. Justin, his twin sister, Jenna, and their 'family' of siblings, body builder Malcolm, sweet girl Bailey and Cole, have just gotten into trouble at school, again. It's not easy being a witch kid with the temptation of using an occasional spell or two. This time their predicament lands them with the witch Congress sending out chaperones called Witchers to guard and relocate them. The kids have been expelled and lose their latest home only to wind up in Callow Mill, New York. Told from the angsty point-of-view of seventeen year old Justin (a guy narrating, yes! ), these five have grown up believing they are all bad because of the black magic practiced by their parents' coven (called Moonset) years ago when their coven began dabbling in black magic and were literally seduced by the dark ways. Their evil ways made them into terrorists and afterwards, they were put to death. The kids were cursed and now can't be separated (within a certain distance is okay, once they pass an invisible barrier there are mega problems to contend with). Whoa, that's some heavy family history to be born into and have to deal with every day. The grown-ups who live with them aren't forthcoming in the information department which is unfortunate for this family. No wonder these kids don't trust adults. But what if they're not evil? I had to wonder and the author does a nice job of setting up the plot and players. The kids and their two guardians are attacked by a hellacious speaking wraith (real badass and right up there with the dementors from Harry Potter). The author doesn't shy away from action or language which helped give the story realism. The witches live amongst men in their own communities and set up their government in Washington, DC like a mirror society to man's world. Callow's Mill was a strange town and held a lot of interesting history. Things picked up when the kids are accussed of using black magic and have to prove they didn't. Moonset has a terrific premise and Scott Tracey created an intriguing supernatural world. Justine's voice held my interest with his clear headed, inquisitive, and quiet way of doing things. He was entitled to have a lot of angst considering his upbringing and treatment by adults. His girlfriend Ash quickly became one of my favorite characters. I didn't find out much about his siblings as I wanted to and wonder if I will during the series. 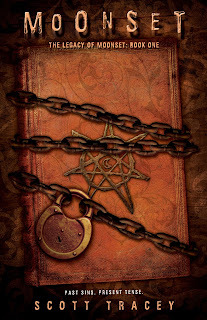 What I enjoyed was the mix of mystery, paranormal devices and propoganda within the witching community and how it impacted the lives of five innocent kids. The pacing held steady except in some spots which had a bit too much description and slowed down but these were bumps in an otherwise smooth and entertaining read. Moonset is a welcome addition to the paranormal YA market. I love this cover. 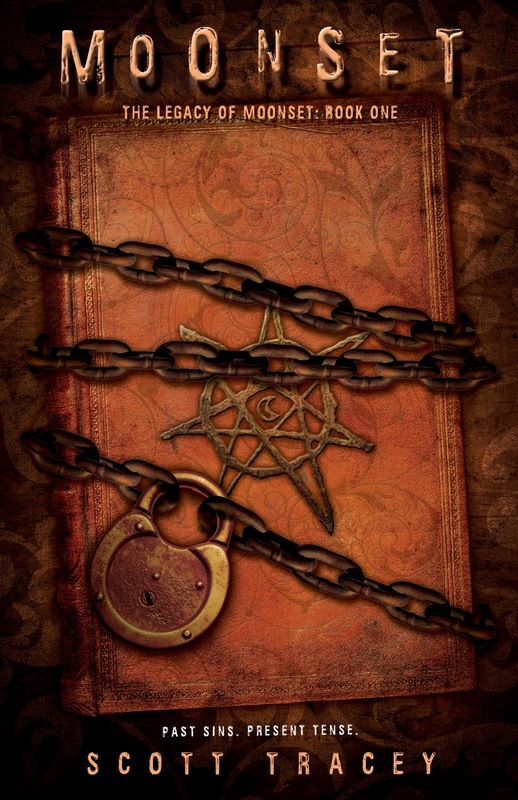 The book cover with the chains wound around it and the lock says it all. It says "Read Me." 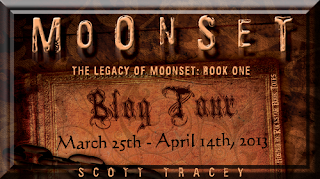 The giveaway for this tour is for a copy of MOONSET to FIVE winners. The giveaway is US only, ages 13 or older to enter. I love Scott Tracey and can't wait to own this one!